Over several months before undercover auditors carrying hidden weapons slipped undetected past security screeners at U.S. airports, the official ultimately responsible for the lapses received cash bonuses and awards that reached nearly $100,000, according to a whistleblower complaint obtained by Reveal. A classified U.S. Department of Homeland Security report, details of which were leaked to ABC News last year, found that the Transportation Security Administration failed to find weapons – including fake explosives – more than 95 percent of the time during 70 covert tests. 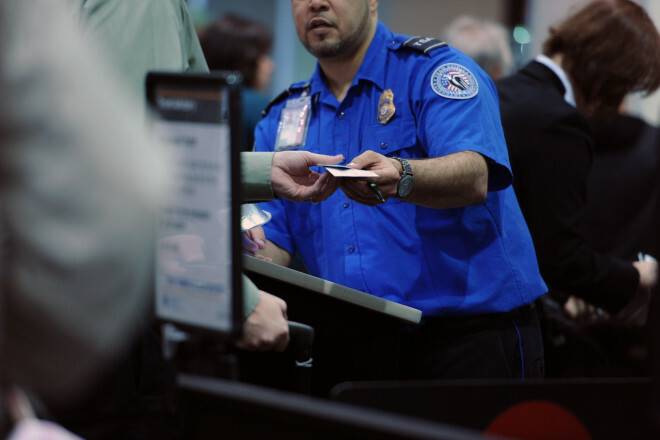 Arlen Morales, a spokeswoman for the inspector general’s office, confirmed the tests occurred from early April to mid-May at eight domestic airports. The embarrassing public disclosure raised the ire of Congress and set off a firestorm within the department, spurring Homeland Security Secretary Jeh Johnson to reassign the acting administrator. At a Senate hearing in June, Homeland Security Inspector General John Roth told lawmakers that he was deeply concerned by the combination of human blunder and technology failure. But the findings weren’t surprising to current and former TSA officials, who say that the security operations office had come to focus on efficiency and reduced wait times. They were surprised to learn that the assistant administrator in charge of screening received bonuses and award money, especially because the agency’s internal tests had flagged security vulnerabilities in the past. The assistant administrator since May 2013, Kelly Hoggan – who manages a workforce of 55,000 employees, including transportation security screeners at roughly 450 airports nationwide – kept his job and $183,000 salary. And, it appears, his year-end performance bonuses and special achievement awards, which he received from November 2013 to January 2015 and tallied about $96,000, according to the whistleblower complaint submitted to congressional investigators. Hoggan, who worked for the aviation industry before joining the TSA in 2004, had no comment, an agency spokesman said. That allegation, made by Andrew Rhoades, an assistant federal security director in Minneapolis, is just one of the complaints of high-level misconduct, inappropriate behavior and questionable personnel practices within the troubled TSA that congressional investigators have received in recent months. Rhoades also alleged that many of the cash awards were recommended by Joseph Salvator, who had served as Hoggan’s deputy, among other roles at the agency. Agency officials initially disputed the monetary amount and timeframe of Hoggan’s additional pay, but declined to comment on the allegation that Salvator recommended or nominated his former supervisor. Alan Metzler, the TSA’s chief of staff, said Hoggan received $50,000 in one-time achievement awards over a roughly six-month period, from fall 2013 to April 2014. Agency officials initially said they were not aware of any other additional compensation. The awards came well before the inspector general’s undercover audits, Metzler said. Investigators found no criminal or administrative wrongdoing in the cash payments, based on the agency’s policy. David Castelveter, an agency spokesman, later walked back some of those assertions. He confirmed in an email that Hoggan also received annual performance awards in 2014 and 2015 but could not provide a monetary amount. He said the special achievement awards were likely about $10,000 each. He declined further comment or to say why Hoggan received the awards. Metzler added that the agency recently had updated its decade-old policy on annual cash awards, issuing a new directive last month that caps them at $10,000 in a calendar year, excluding performance awards and bonuses. Two powerful House committees now are investigating misconduct within the TSA, including bad behavior by high-ranking officials, and how the agency has tackled the problem. The House Oversight and Government Reform Committee, the lower chamber’s main investigative body, and the House Homeland Security Committee each have asked the Homeland Security Department to provide records on how it handles misconduct within its ranks and by its senior leaders. Rep. Jason Chaffetz, R-Utah, chairman of the House Oversight and Government Reform Committee, sent the first letter in December requesting internal misconduct records, including among the agency’s executive ranks, since Oct. 1, 2012. In his letter, Chaffetz highlighted the significant amount of misconduct within the TSA. Between 2010 and 2012, the agency found that more than 4,500 employees had engaged in misconduct serious enough that they needed to be suspended or fired. Chaffetz, through a spokeswoman, declined an interview request. The TSA, which Congress created shortly after the 9/11 terrorist attacks, has had a long history of scandals, trouble and allegations of misconduct. The House oversight committee also held a hearing last year examining issues within the Federal Air Marshal Service, a subagency. Chaffetz launched an investigation in early 2015 following a Reveal report that the Justice Department was investigating allegations that potentially scores of employees had been involved in a scheme to manipulate their flight assignments for trysts and preferred missions. This new investigation aims to look at misconduct across the agency. Peter Neffenger, who was sworn in as TSA administrator in July, is committed to integrity, accountability and transparency as the counterterrorism agency strives to make the nation’s airlines and passengers secure against evolving threats, Metzler said. For Kenneth Kasprisin, who held several positions within the agency, including acting administrator and deputy administrator, the leaked results of the inspector general’s audit were not a revelation. “The findings were representative of known security problems – this one just happened to be leaked,” he said, adding that the agency’s own covert tests dating back to at least 2013 had found significant weaknesses. He said the Homeland Security Department wrongly pushed out then-Acting Administrator Melvin Carraway in the fallout of the leaked report. Ed Goodwin, a retired federal security director in Jacksonville, Florida, who recently won a default judgment from the U.S. Equal Employment Opportunity Commission stemming from a discrimination complaint against his former employer, said the agency’s problems start at the top. Andrew Becker can be reached at abecker@revealnews.org. Follow him on Twitter: @ABeckerCIR.